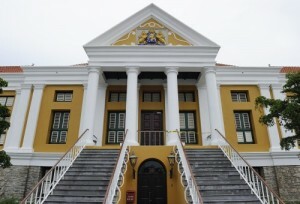 WILLEMSTAD – Former ministers and suspects in the Maximus case, George Jamaloodin and Elmer Wilsoe have lost their case against the public prosecution. Both have filed a lawsuit to have their names removed from the suspect list. The judge ordered today that both will remain suspects in the investigation into the intellectual authors of the assassination of the popular politician Helmin Wiels. George Jamaloodin was Minister of Finance during the Schotte cabinet and was arrested last year in connection with the investigation. Elmer Wilsoe was also a Minister during the Schotte government and is named as the one who indicated to the assassins where Helmin Wiels was.